Have you been contacted by the IRS? Did the IRS recently audit you? If you’re facing a large-dollar amount in backed taxes with the IRS, you’re going to need an experienced tax attorney to assist in undertaking the collections process. Tax liability exceeding $100,000 is assigned in the IRS as a “resolution” case, which is handed off to a Revenue Officer. They use aggressive collection tactics to collect the money owed. In this situation, the best action is to call Tax Law Offices in Naperville. We’ve assisted hundreds of clients with high-dollar tax liability conflicts. Our mission is to immediately stop the aggressive actions the IRS takes to collect and reduce your liability as much as possible. 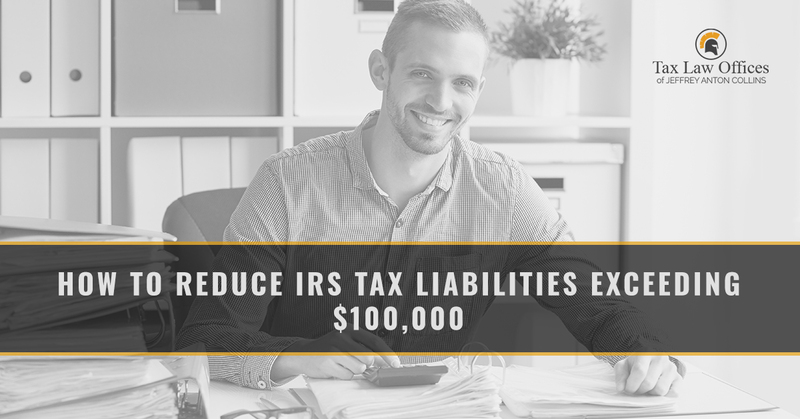 In this post, we’ll share ways your criminal tax attorney can reduce tax liabilities exceeding $100,000. What does the IRS collection process look like? Eventually, your tax debts will be assigned to a Revenue Officer, as mentioned above. The collection process will begin, and you will be obliged to pay what you owe until the account is satisfied according to the terms and agreement with the IRS. You will initially receive a letter from the IRS stating that you owe them money, whether you filed or not. The best case scenario if you can’t pay what you owe is to set up a payment plan. However, this can be confusing because the IRS has multiple plans you can choose from based on your debt situation. Nonetheless, it’s best to pay what you can and acknowledge that you owe something instead of running and avoiding your tax liability. In any case, you may not owe what the IRS claims you do. If you are said to owe $100,000 or more, whether it’s valid or not, you need an experienced tax attorney to assist you through the collections process. Finally, the IRS will continue to work with you to collect the money you owe them through payment arrangements and eventual wage garnishment. You don’t want the IRS dipping its fingers into your bank accounts. A professional tax attorney serves as your advocate when dealing with the IRS. Not only do audit attorneys help you understand your audit situation, but they also serve to deter the IRS from using aggressive tactics to collect on the debts owed; they are your negotiator and liaison. An experienced tax attorney will understand the intricacies and complexities of tax law to help you avoid paying more than you owe. You will have attorney-client privilege, which means you’re safe to share everything with your attorney when discussing your IRS problems. During these discussions, your tax attorney will be able to give you advice, foster assurance, and increase morale due to their knowledge and experience earned when dealing with the IRS. In some cases, you will head to tax court to settle your debts with the IRS. You don’t want to fight the IRS alone if you’re going to court. Find a local criminal tax attorney in Naperville and give them a call. It’s imperative you have someone with knowledge, experience, and a great reputation in your corner. Are you being charged with tax evasion? Serious tax offenses carry extreme consequences. Your best bet is to hire a tax attorney and work with them to get your sentencing, penalties, and fees reduced as much as possible. In any case, a great tax attorney can help get you the best outcome possible. Are you under criminal investigation by the IRS? In most cases, you won’t know you’re being investigated until after you’ve been charged with a tax crime. However, if you think you’ve done something wrong with your taxes but haven’t been contacted by the IRS, it may be time to talk to a tax attorney to see how to resolve your past. Tax fraud is a huge offense against the IRS. You will need a tax attorney to help you work through communications with the IRS and potential trial upcoming. It’s not a great idea to try and fight the IRS on your own, as it can result in greater consequences than originally charged. Facing tax penalties? Penalties can amount to a large portion of money owed to the IRS. If you fight this alone, you’ll most likely end up owing more than your original charge required. A qualified tax attorney may be able to show the IRS that there was a legitimate reason for not following the tax law, which can result in reduced penalties and fees. Tax Law Offices in Naperville will work to reduce your tax liability! You need a criminal tax attorney with years of experience and knowledge in tax law to get the best outcome for your situation. Also, you need an attorney who has extensive training and familiarity with IRS procedures, whether it be filing, collections, or more. Do you need to reduce your tax liability that exceeds $100,000? Call Tax Law Offices in Naperville today!